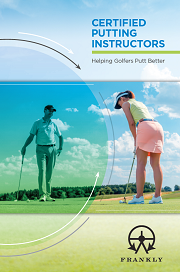 As the Associate Vice President of the Université de Moncton in New Brunswick, Canada, Dr. Jean-François Richard has taken an interesting pathway to become a Frankly Certified Putting Instructor (CPI). Dr. Richard has a wealth of experience and knowledge in sports coaching, teaching and learning, having been a university professor for over 19 years. He is an outstanding athlete himself having competed in athletics at the national level as a sprinter and has also coached on the international stage in both athletics and ice-hockey. Recently he joined PGA of Canada and is focusing his attention on golf. “The CPI Course was very informative. 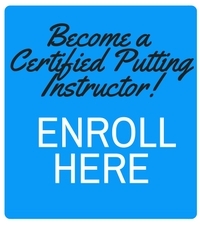 I am new to the PGA of Canada and going through the process of becoming completing my Class A accreditation with the PGA of Canada, even though I have another career. “I found the CPI Course to be well organized and progressive. It was very complete and covered not only teaching, but the technology aspects as well as the different rules of golf in relation to putting. There was a great amount of content that was included in a manageable course that was just the right length. There is a lot to consider in putting and it was well presented,” said Dr. Richard who himself has developed many education curriculums and has a B.Ed. in Physical Education, MSc in Education and a PhD in Kinesiology as well as an impressive research background. To this effect, Dr. Richard was named the 2007 Dr. Tait MacKenzie Scholar of the year by the Canadian Association for Health, Physical Education, Recreation and Dance (CAHPERD) for his contributions to research to teaching and coaching. “The degrees of freedom were a great base to start from and understand the sources of error in the stroke. Many people are not aware of all the deviations that can occur,” said Dr. Richard who sees parallels with the PGA of Canada certification and the online study approach adopted in the CPI course, which he believes to be very important. After total hip replacement surgery at 33 years old, Dr. Richard wanted to stay involved with sports and became hooked on golf. He became an avid golfer and became very interested in the different aspects of golf coaching. In 2017 he joined the PGA of Canada and works part time at the Louis Melanson Golf Academy in Moncton, while fulfilling his professional responsibilities. “Louis is a very well-known and well respected coach and we have known each other a long time. It is great to work with him and strive towards the goals of his academy”, said Dr. Richard who wants to be involved in instruction and coaching juniors and adults, in all aspects of the game, both recreationally and competitively. Already his students are seeing the results of his CPI studies.